New four-story, 68,000-SF performing arts center and cultural campus is built on the site of the former Bethlehem Steel, the largest privately-owned brownfield in the country. Center includes 530-seat Musikfest Café for amplified cabaret style music, a 4,000-SF community conference room, two-screen art cinema, a commons area and outdoor lawn seating amphitheater. Acoustic challenges entailed helping shape the performance spaces to reflect the architectural aesthetic that ties with the site’s industrial heritage while also achieving an intimate performance space. Solutions for reverberation control, sound isolation and mechanical/electrical noise and vibration control were carefully integrated into the space design and support the desired aesthetics. The result is a unique visitor experience that celebrates the heritage of industrialism and revitalizes the spirit of work and play for discerning modern audiences. 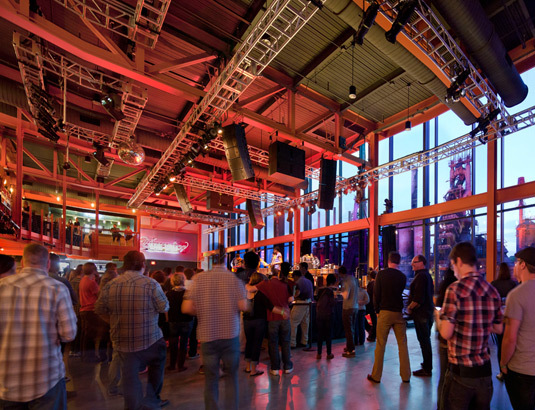 Views of the towering ‘stacks’ of the dormant blast furnaces serve as a back drop in the popular Musikfest Cafe venue. The Center brings new life to the former home of the U.S.’s second largest steel manufacturer as a hub for music and art. The Center revitalizes the local community through offering more than 1,000 concerts and eight different festivals annually.